"SAP" stands for Systems, Applications, and Products in Data Processing. SAP is a world-wide market and technology leader in client and server enterprise application software, providing solutions for companies of all sizes and industry sectors. SAP Business One is an affordable, integrated enterprise resource planning (ERP) solution designed to enable growing small to midsized enterprises (SMEs) and large enterprises with subsidiary operations to better manage their entire company. What is the Key Difference Between ERP and Accounting Software? Accounting software packages only handle the individual business function of accounting, whereas an ERP application handles the entire range of business functions of an organization including: Finance, Human Resources, Sales, Marketing, Logistics, and more. What Type of Company is SAP Business One Designed to Support? SAP Business One is designed specifically for small to midsized businesses that have outgrown their current packaged accounting software or spreadsheets and/or may need to replace multiple, non-integrated applications. SAP Business One is also designed for subsidiaries of larger enterprises. What Core Functional Areas are Supported by SAP Business One? The core functional areas supported by SAP Business One include: Accounting and Finance, Reporting, Purchasing and Operations, Inventory and Distribution, Sales and Customer Management. What are some of the Benefits of Using SAP Business One? What Types of User Licenses are Available in SAP Business One? There are 4 license types available: Professional User, Limited CRM User, Limited Logistics User, Limited Financial User. Does SAP Business One Adapt to my Business' Specific Industry Requirements? With over 550 prepackaged, fully integrated industry-specific solutions, SAP Business One provides your business with the tools your business needs to succeed. What Kind of Reporting and Analytics Capabilities are Included with SAP Business One? SAP Business One provides powerful integrated analytic and reporting tools, such as Crystal Reports and HANA that enable you to access critical business information drawing on all functional areas including; accounting, sales, purchasing, production, inventory, service, and operations. SAP Business One is available as an on premise or hosted solution through Amazon Web Services (AWS). How Long Does it Take to Implement SAP Business One for my Business? There are several factors that determine how quickly SAP Business One can be implemented and customized to your Business including: size of your business, complexity of your business structure, type of ERP deployment, and any specific add-ons or customizations. What does the Implementation Process Include? The implementation process includes a project planning phase, business blueprint, project realization, and Go Live. Can SAP Business One and Add-ons Scale to Support my Business' Future Growth? Yes, SAP Business One provides a scalable solution that not only meets your fundamental business management needs today, but can also be scaled to handled and increased number of transactions generated by a growing customer base. Can I Transfer my Existing Business Data into the SAP Business One Application? Yes, data migration from your old system to SAP Business One can be imported from a text file, Excel spreadsheet or manually. SAP Business One also uses the Data Transfer Workbench add-on to ensure data migration is performed quickly and easily. Note: there may be some limitations on the transfer of certain historical data. When you request a quote, you will receive the standard cost for the SAP Business One application along with the additional costs based on number of users, type of access required, professional services for implementation, maintenance fees and extra hardware. What are the Basic Software Requirements to Run the SAP Business One Application? Recommended System Requirements for 30 Users: Processor: 2 Intel Xeon E7 (or equivalent), Memory (RAM): 16 GB, Hard Drive: Raid 10 320 GB, Drives: DVD-Rom, Display: 1600x900 or higher. What Support Options are Available After the System Goes Live? Vision33 supports your business well beyond the initial implementation phase through the Vision33 TOTAL Care support program carried out through team of dedicated SAP Business One consultants that have extensive experience with SAP Business One. To learn more about additional training opportunities available to Vision33 customers, please visit our Resources page. As a part of the Vision33 TOTAL Care program, businesses receive access to many ebooks, videos, and resources available on our blog, resources page and youtube channel. How Often Does SAP Release New Versions of SAP Business One and What is the Long-term Strategic Vision for the Solution? SAP continues to focus on extending core functionality as the market serviced grows from SME to also include the higher end market. How does SAP Business One Cloud work? Amazon Web Services (AWS) operates, manages, and controls the components from the host operating system and virtualization layer down to the physical infrastructure and facilities. Vision33, your SAP Business One implementation partner, manages the guest operating system and any running applications and databases. Is SAP Business One Cloud certified on AWS? Yes, both SAP Business One, version for Microsoft SQL Server and SAP Business One for SAP HANA have been certified on the AWS cloud platform. How long has AWS been partnering with SAP? SAP has been working together with AWS since 2008 and became a cloud services partner in 2011. AWS offers companies solutions for migrating and deploying SAP Business One Cloud. How long has Vision33 been a member of the AWS Partner Network? Vision33 is the only global SAP Business One partner in the world that is a member of the Amazon Partner Network (APN) since accredited in 2012. As the only SAP Business One partner to achieve the AWS SAP competency certification, Vision33 has expertise in migrating SAP Business One on-premise customers to AWS as well as implementing SAP Business One Cloud for new customers. How can I test out SAP Business One Cloud? If you would like to see SAP Business One Cloud, contact us and a Sales Consultant will arrange a demo at your earliest convenience. 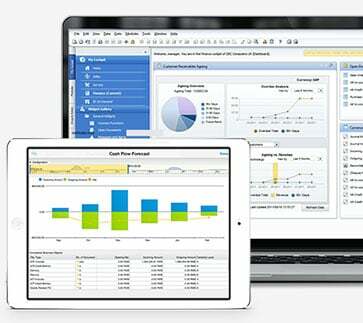 If you would like to see SAP Business One in action, please register for our weekly demo. How does SAP Business One Cloud licensing work? Licenses are on a pay-per-user subscription-based model. You can add or scale back users at anytime. Can I use my existing SAP Business One licenses on AWS? Yes, companies can use their existing SAP Business One licenses on AWS. Is AWS secure? What is the level of security and who owns the data? AWS has been designed as one of the most flexible and secure cloud computing environments available today and combines comprehensive security capabilities to satisfy the most demanding information security requirements. Vision33 follows AWS best security practices, ensuring that your data is safe. We can coordinate with each customer’s needs, even restricting access to pre-established IP addresses. Customers retain ownership of any data stored on AWS. Neither Vision33 nor AWS has access to customer data. How often are data backups run on AWS? Database backups are run on a daily basis and stored in a cloud container. This container is secure and replicated to make sure that it is highly available and safe. What happens in the event of a server crash? How does this impact downtime? AWS will use commercially reasonable efforts to ensure a 99.95% uptime. In the case of the AWS cloud, the environment is not a server but actually an image. The case of image instability is extremely rare, however, if it should become unstable, the instance would be moved to a better underlying software, which takes only 5 minutes - resulting in a low impact on your operations overall. Does the monthly pricing for SAP Business One Cloud include unlimited data usage? Incoming SAP Business One data (internet usage) is included in the price, as is data storage. What is the regional availability for AWS and how does AWS comply with regional regulations? AWS has cloud facilities located in several regions throughout the world. Vision33 is responsible for ensuring that all customer data is stored in the appropriate cloud facility to comply with all regulations. How does AWS work with SAP Business One certified add-ons? SAP Business One certified add-ons will work the same as they do in an on-premise environment. Can you use Microsoft Excel with SAP Business One Cloud? Yes, SAP Business One Cloud offers an easy way to provide a managed, cloud-based desk experience to users that supports familiar applications like Microsoft Excel. Will Microsoft Outlook integrate with SAP Business One Cloud? Yes, Microsoft Outlook will work the same as it does with an on-premise integration with SAP Business One. When I save an SAP Business One report will it be saved on my computer or on the cloud? Users can choose the destination folder to save a report using a mapped drive to a local computer. Will I be able to print to my local or network printer? Yes, both locally attached or network printers are supported. Will I be able to upload files from my computer? Yes, users can upload local files to the cloud using an FTP client. How long will it take to setup my database? Vision33 can set up an environment within hours. However, final installation times may vary depending on the SAP Business One add-ons included in the solution. How do I migrate SAP Business One from on-premise to AWS? The migration from on-premise to AWS can be completed quickly: Vision33 consultants will first create a copy of your environment in the cloud, then once the environment is prepared, Vision33 consultants will apply your database backups to that environment. Once I move to the cloud, can I ever go back to on-premise? Yes, if you ever decide to take your data back to your on-premise solution, Vision33 will work with you to hand over the database backups and ensure the process is seamless as possible. Who is responsible for Windows updates, patching, operating system errors/issues, etc.? Windows updates, patching, operating system errors/issues, etc. are covered by the annual maintenance fees associated with your services contract with Vision33. Vision33 certified consultants will carry out these services. Will Vision33 manage our SAP Business One installation via the Cloud Control Center or can I manage my own individual installation? There are two options available: you can manage your own individual installation, or you can choose to have Vision33 manage your SAP Business One installation via the SAP Business One Cloud Control Center. By migrating to SAP Business One Cloud, am I losing any features or functionality? No, you can access all the benefits of SAP Business One Cloud same as you would with a traditional on-premise implementation. In fact, there are extended benefits when using SAP Business One Cloud, including mobility, speed and accessibility. How much does this cloud offering cost? Pricing for SAP Business One Cloud is based on a pay-per-user model, so you only pay for the resources you need and use. As your organization grows and your needs change, you can scale SAP Business One Cloud to meet your business needs and the size of your employee base. Additional fees may apply to cloud storage beyond the base volume included. To find out more about SAP Business One Cloud pricing, contact the nearest Vision33 office. Does the monthly pricing cover Windows and SQL licensing? Yes, licensing for both is included in the pricing. What about licensing and maintenance fees? You are responsible for your own SAP Business One licensing and the regular annual Vision33 and SAP Business One maintenance fees. How do I add a new user in SAP Business One Cloud? To add a new user in SAP Business One Cloud, you create a case with the Vision33 TOTAL Care team. Is SAP Business One, version for SAP HANA available on AWS? Yes, both SAP Business One, version for Microsoft SQL Server and SAP Business One, version for SAP HANA have been certified for production on AWS. What is the Hardware configuration for SAP Business One Cloud, version for SAP HANA? Vision33 provides SAP approved SUSE systems for SAP Business One version for SAP HANA on 64Gs Ram increments as well as a DC and a Remote Server system. What are the minimum number of SAP Business One version SAP HANA User licenses for an AWS deployment? There is presently no minimum. To request a quote, contact a Vision33 sales consultant. Which deployment method is the most feasible for SAP Business One, version for SAP HANA, on premise or on the cloud? SAP Business One, version for SAP HANA on-premise is the most cost feasible when comparing the overall IT and upgrade costs to the system. Which versions of SAP Business One are compatible with Vision33 Portals? Vision33’s Portal solutions currently supports SAP Business One version 9.2 and SAP Business One version 9.3. How does licensing work for Vision33 Portal web add-on solutions and Integration solutions for SAP Business One? Portals and Integration solutions are licensed per SAP license server – this will provide access to one company (SAP Business One database), including add-on modules Order Pad and B2B Marketplace. Employee Portal – Sales user and Expense user are named user licenses. Additional company licenses are available across all products. What's included in hosting services for the Vision33 Portals? What's not included? The applications are installed on our shared hosting server and include a shared certificate and base domain name. The base domain name is included in the URL (e.g. https://b1portal.com/YourNameHere). Dedicated hosting is also available upon request. How soon after the software is purchased can I start using it? What is the ideal time to implement certain products? We must implement the software (installing in your environment and blueprint/configuring the software) before you can use it. We can generally start implementation within a week of the purchase, but we do require the SAP Business One database to be configured and ready for go-live. (You will work with our staff to ensure optimal time for installation). How do I sync my data to the portal? No syncing is required, you can write SAP Business One queries which you can publish to the portal, it’s all sitting directly on the SAP Business One database. Data is stored in SAP Business One. Vision33 Portals access SAP Business One in real-time to access the necessary data. How are Vision33 Portal users managed? Users are managed within the administration add-on, and on the business partner master record for customers and vendors or the employee master record for employees. Do I need a developer when I want to add new reports, dashboards, widget etc.? No. We leverage the standard user queries feature of SAP Business One, executing reports real-time in your portals. Do I need a user account for each Vision33 Portal login? Vision33 Portals require one indirect instance license for the portal to connect to SAP Business One. Portal users are then assigned on either Business Partner record contacts or Employee Records.